As early as 3500 B.C., women have been dying their lips varying shades of red extracted from crushed clay, ants, and even beetles. Some of the ingredients used were believed to be poisonous, but that did not stop them from painting their lips. Lucky for our generation, we do not have to risk damaging our lips in exchange for some color. Today, almost all makeup brands have their own rendition of a classic red lipstick. From orange red to dark blood red, women can easily choose whatever shade of red they want to try. This time, I decided to try a red cult-classic from MAC, the Ruby Woo Retro Matte lipstick. 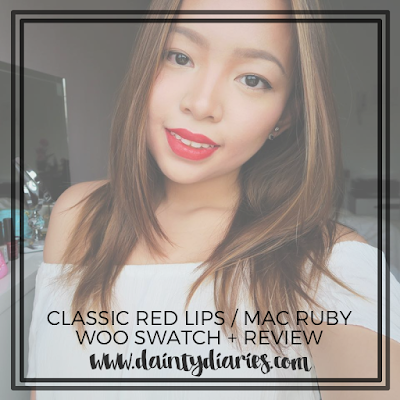 According to the sales associate who assisted me, MAC Ruby Woo is the most popular and most sought-after lipstick shade from their brand. True enough, it took me several visits to get my hands on one since it's often out of stock. 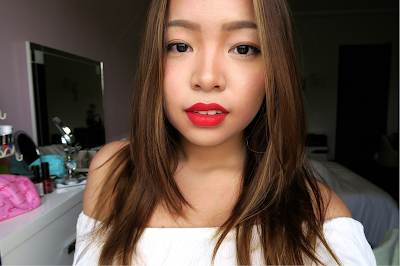 To really test the intensity and longevity of Ruby Woo, I decided to wear it without lip liner. I started by applying a thin layer of lip balm to smoothen my lips and reduce crevices. The formula of the lipstick is really dry, making it a bit hard to apply. I applied the lipstick starting from the center of my upper lip moving outward toward one corner, and then did the same toward the other side. For my bottom lip, I applied it first on the sides, and then filled in the middle part. I blotted it by pursing my lips together, then reapplied for another coat. 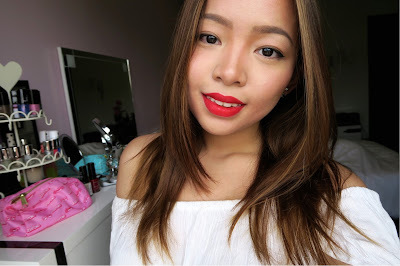 Ruby Woo is a very "in-your-face" firetruck kind of red that's wearable even for daytime. It has a really beautiful matte finish, which screams boldness with a hint of elegance. After applying it, I noticed that it actually has a bluish undertone that makes your teeth seem whiter than they really are. The color fainted a bit after I ate, which I think is pretty normal. So if you want to retain the intensity of the color the whole day, you will need to reapply after eating.